Organizations have been managing rapid change for decades. But their performance is also now increasingly disrupted by severe surprises and shocks, difficult if not impossible to avoid. Together, rapid and disruptive change exacts a high toll. The toll on individuals and teams is tremendous, but entire global supply chains, innovation networks, communities and industries are also being challenged as never before. Turbulence can never be mastered until new mindsets and capabilities are aggressively built. That is what High AR is all about. Drs. Joseph McCann and John Selsky have spent over twenty-five years writing about and working with organizations adapting to significant change. Their work has often been cited, debated, and applied. 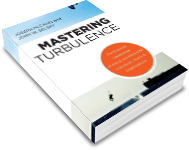 Their latest contribution, Mastering Turbulence: The Essential Capabilities of Agile & Resilient Individuals, Teams & Organizations (Jossey-Bass/Wiley, 2012), is a ground-breaking work that brings multiple strands of research and practice together for the very first time. From neuro-science to global value chains, from individual employees to entire ecosystems composed of multiple organizations, the essential capabilities needed for mastering turbulent change can be identified. The information provided in this website is intended to improve the practice of change management and build on the knowledge base that they gladly share. They provide an integrative model that allows organizations to not only understand the sources and consequences of turbulence, but design and initiate interventions that will improve and sustain high performance. The case studies they use and empirical research that has guided their work are designed to highlight lessons that can be applied by anyone. They sincerely believe that the collaborative creation and sharing of knowledge about change management is the basis for significant progress for all organizations. There are five capabilities that promote High AR which is essential for mastering turbulence and sustaining high performance. Participate in our confidential online survey and determine your AR levels and alignment across individual, team, organization and ecosystem levels for all five capabilities. The book which captures all the very latest concepts and practices associated with understanding turbulence and creating strategies that build High AR. Ground-breaking in its integrative approach and insights.